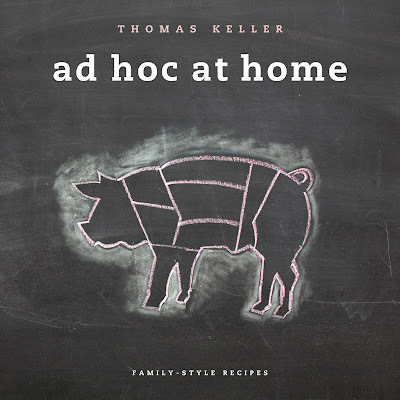 Eating L.A.: Win Thomas Keller's Ad Hoc at Home! 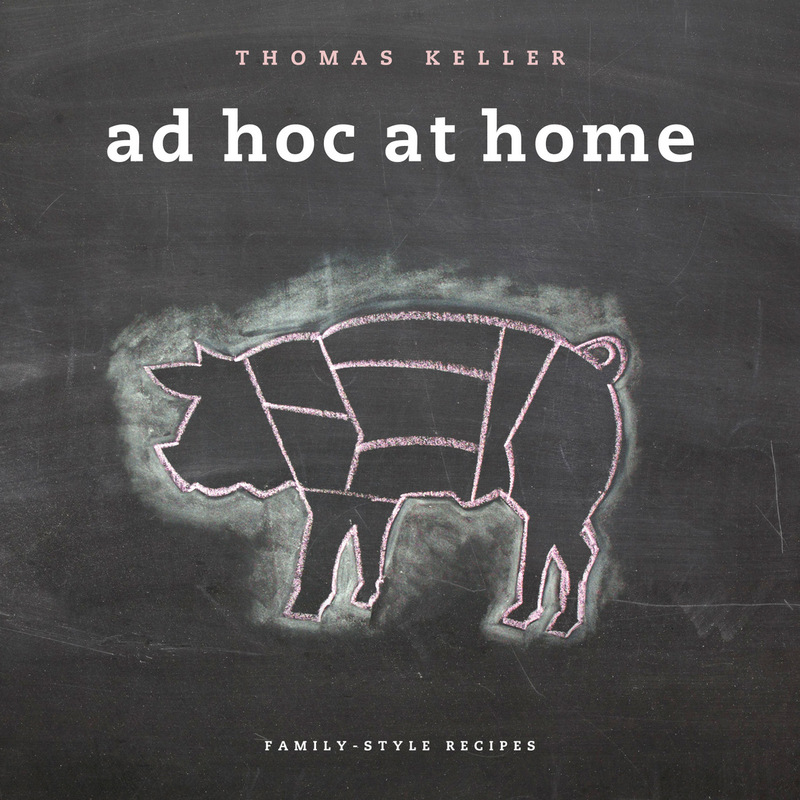 Win Thomas Keller's Ad Hoc at Home! In honor of the Bouchon opening party tonight, where supposedly I will be hobnobbing with the likes of Gary Oldman and Ryan Seacrest, EatingLA is giving away a copy of Thomas Keller's new Ad Hoc at Home cookbook. These family-style recipes look wonderful, especially the scallion potato cakes, just in time for Hanukah. What type of business was originally in the building where Keller's French Laundry is located? and, for the tricky one: The original owners of the French Laundry restaurant relocated to another Northern California town in an area which sports its own dialect? What is this invented lingo called? 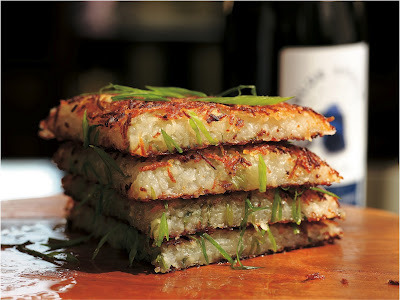 In the meantime, here's the recipe for scallion potato cakes to tide you over. While potato pancakes can be made by grating potatoes straight into the pan, we grate and rinse them, squeeze them dry, and toss them with cornstarch. The cornstarch prevents the potatoes from discoloring and helps to bind the cakes (they don’t contain any eggs) and make them crisp. These can be served with duck or with corned beef, and topped with a poached egg. You could make smaller individual cakes to serve as an appetizer with smoked salmon and Horseradish Cream (page 57) or Slow-Cooker Apple Butter (page 249) and sour cream. These are best eaten immediately, but you can keep the first and second batches warm in the oven while you cook the final one. et up a food processor with the coarse shredding blade. Peel the potatoes and shred them. Immediately transfer them to a large bowl of cold water and swirl and rinse the potatoes. Lift them from the water and dry in a salad spinner. Transfer to another large bowl. Spoon the cornstarch around the sides of the bowl and toss the potatoes with it (adding the cornstarch this way will help to coat the potatoes evenly). Do not let the potatoes sit for too long, or they will release their starch and the centers of the potatoes can become sticky. Heat some canola oil in a 10-inch nonstick frying pan over medium-high heat until the oil is shimmering. Turn down the heat to medium. Add one-sixth of the potatoes, gently spreading them into an 8- to 9-inch circle. Keep the potato cake light and airy; do not press down on the potatoes. Season with a generous pinch each of salt and pepper. Reserve a cup of the scallion greens for garnish, and sprinkle one- third of the remaining scallion greens over the potatoes. Carefully spread another one-sixth of the potatoes on top; again, do not press down on them. Season with salt and pepper. Cook for 6 to 7 minutes, to brown the bottom. You should hear the potatoes sizzling in the oil; if the potatoes get quiet and are not sizzling, or the pan looks dry, add a bit more oil. Turn the pancake over to brown the second side. The pancakes are somewhat fragile and can be difficult to ﬂip with a spatula; if you don’t feel comfortable turning them, invert the pancake onto the back of a baking sheet, held tilted over a second baking sheet, as some oil may seep out, then return the pan to the heat and slide the potato cake into the pan browned side up. Cook until the second side is browned and crisp, then transfer to the rack and keep warm in the oven while you cook the remaining 2 pancakes. Cut each pancake into 4 wedges, stack on a platter, and garnish with the reserved scallion greens. That cookbook looks very promising. Was just gifted this book. If there's one photo that caught my eye it was the scallion potato cakes. Can't wait to make them! Have you cooked any other recipes recently from the book?